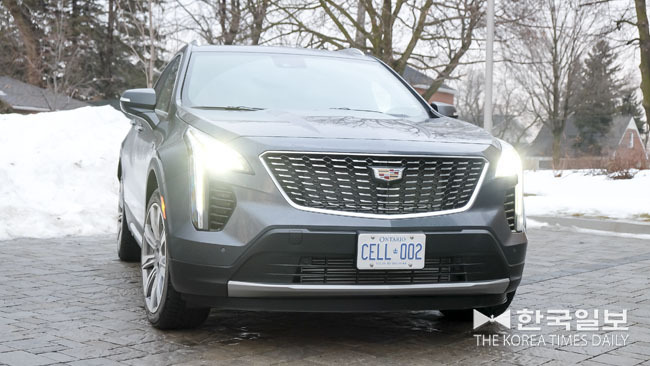 The competition for small luxury crossover utility market has been heating up for some time and Cadillac arrives late to the party. And as a latecomer, the all-new XT4 better have the goods to grab attention away from such established players as the BMW X1 and the Mercedes-Benz GLA. Imagine Cinderella – in her dainty glass slippers – walking into the ballroom full of bitchy noble maidens, all vying to catch the prince’s eye. Could the XT4 expect to have the same effect? The XT4 certainly is one of the more attractive of the bunch. 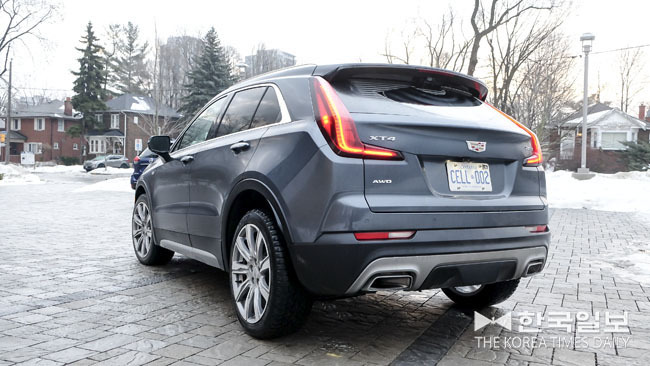 Its exterior styling, while similar to its bigger sibling, the XT5, seems sleeker and trendier. The massive front grill and the narrow head-lights give it an adequately menacing demeanor. Taillights coming down from the roof along the D-pillars also help to make the car look sportier and differentiate from the XT5. About the size of Chevy Equinox, the XT4 can be categorized as compact luxury CUV and it’ll probably go head to head with the likes of Lexus NX, Infiniti QX50 and Acura RDX. However, when it comes to the German rivals, at least in sales, Cadillac has long way to catch up. One thing going for the XT4 is its relatively low price. As a front-wheel-driver only, the base ‘Luxury’ model starts from around $35,000. Check the box for AWD and the price increases to $37,795, which is still very competitive. Both the Premium Luxury and the Sport models, equipped with standard AWD, start the count at $42,795 before taxes and other mandatory expenses. Unfortunately, the starting price is exactly that. Similar to many German brands, one needs to pay extra for numerous option packages and those can add up pretty fast. Case in point is the Premium Luxury model loaned to this writer for the week-long test-drive. It comes with Technology, Enhanced Visibility, Driver Awareness, Driver Assist, Comfort and Convenience packages, as well as stand-alone options as Bose premium audio, dual-panel sunroof, 20 inch alloys and the special metallic paint. All in all $13,615 worth of options pushes the before-taxes MSRP up to the European territory of $56,510. Included in this price are navigation, 4G wifi hotspot as well as wireless charging, Apple Carplay/Android Auto connectivity, head-up display, auto climate, heated leather seats, heated steering wheel, power lift-gate, etc. Impressive list of the requisite electronic nannies as smart cruise-control, forward collision mitigation, pedestrian detection, lane-keep assist and so on are also present and counted for. The thick leather-wrapped steering-wheel has paddle-shifters and feels well-balanced. The seats are comfortable enough for long highway jaunts and the rear seats have enough leg and headroom for adults. The cabin is airy and layout is clean and elegant. Materials used are mostly of high-quality but some hard plastic can still be felt in places. Overall fit and finish also seems to be less than stellar. 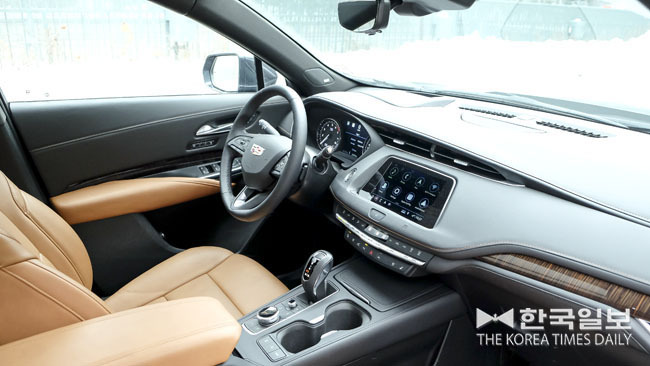 Many people, including this writer, had reservations (to put it mildly) about the last-generation CUE (Cadillac User Experience) interface. The new system in the XT4 is much improvement with both touch screen and the rotary controller located behind the gear-shift lever. First of all, thanks Cadillac for adding the volume dial. The touch screen and the climate control buttons are also easier to use. The controller dial, however, needs to toggle right and left and up and down, not just scroll. 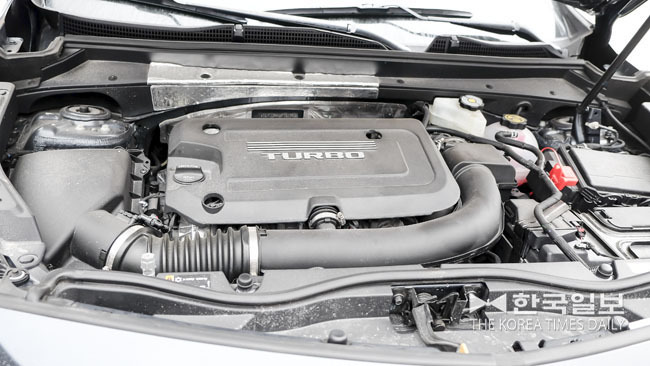 The two-litre turbo four seems to be the engine configuration of choice nowadays. Cadillac’s version in the XT4 develops maximum 237 horses and 258 lb-ft of twist, which is about par for the course. Compared to say the GLC 300, the XT4’s motor does not feel as polished. It is powerful enough but it sounds coarse at times. There also seems to be bit of turbo-lag. On the other hand, the nine-speed automatic transmission shifts smoothly and never hunts for gears. To help save fuel, the XT4 comes equipped with an auto stop/start system. You can switch it off if you want to. The drive modes consist of Tour, AWD and Sport. In Tour, the XT4 only drives the front wheels for maximum fuel-efficiency. AWD is self explanatory. AWD is also engaged in Sport, where each gear is held longer and the car hunkers down a little for more spirited driving. The test-vehicle being the Premium Luxury model, this writer expected it to have more compliant ride. But going over small potholes and bumps, the car feels jittery than it should. Perhaps one should leave the 20 inch alloys to the Sport model and stick with 17 or 18 inchers. As a newcomer to the segment, the XT4, while equipped to compete, does not set any new standards. It is stylish, practical, roomy, powerful, has many of the latest technology and is also a great value, if one does not go overboard when ordering extra options.